Hi - it's been a while since I've posted. I'm still interested in knowing if anyone doing any editing of this film would be interested in changing the title from "Indiana Jones and The Kingdom of the Crystal Skull" (too long and clunky in my opinion) to just "Marauders of the Crystal Skull." I've always felt that my idea for the title sounded more in keeping with the Indy movie titles, particularly when you consider it's likely the last Indy movie. It would be a nice way of book-ending the series with the first movie's title ("Raiders of the Lost Ark"). I am helping my wife edit a video/photo collage from her school. In all, it is about three minutes long, one video completed in Womble, burned with DVD Lab Pro. It plays fine on the computer and our home DVD player but a) won't load in one at school and b) appears black and white and has audio glitches in another. I used Verbatim discs, so I'm not sure what the issue is, unless it is the small video size. What can I do to fix this? Complete Version Of Metropolis Discovered! Second, it was not a pretty good film at all. I found myself wincing everytime Ahsoka said "Skyguy". What the hell kind of way is that to respect the Jedi that's been charged with teaching you? At least Anakin always referred to Obi-Wan as "Master". And I find it hilarious that Jabba simply takes Dooku at his word that it's the Jedi that have kidnapped his son, rather than send his own cronies out to find out for sure. As you guys have noticed, I've not been around much lately at all. I came here to get reaction to the new movie that came out this summer. I had been thinking "Maybe this time things won't be so bad. Maybe this time a new SW movie will be okay." This post made me realize that I never want to see The Clone Wars animated movie. "Skyguy?" Seriously. That makes me puke. A plot involving Jabba's son? What? WHAT?!? This whole thing sounds like a bottom-of-the-barrel fan-fic written by a 13-year-old girl with a crush on Hayden Christensen. At least I didn't miss anything. I hope all is well with all of my old friends here. Talk to you again soon! I actually found SSW:TESB to be much easier than the first SSW. I've not played SSW:ROTJ, though. It's so great when Vader says, "All too easy" in the fights. 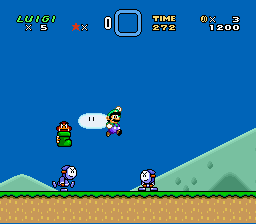 Yeah, I'm still stuck on SNES and Super Mario World. 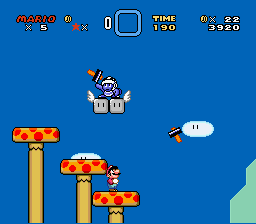 I'm still plugging away on my own hack of SMW. When I get a demo out, I'll let you guys know here so you can play. Anyone else using the Twilight Hack for their Wii yet? It's great! Cool - I'm done maintaining this then. If for some reason someone needs the html/bbcode for the list here, PM me. Would someone else be interested in maintaining this list? I have lost the interest/time in making updates. I apologize. I may play yours on my PS2 aswell. It looks most impressive, is it finsihed yet? It is nowhere near finished yet, unfortunately. 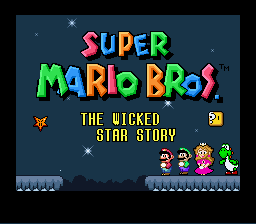 When I finish World 2 (hopefully in a few weeks), I will probably put out a demo. 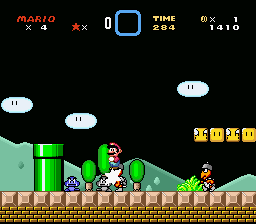 Just out of curiosity, how come you're using the SMB3 (All-Stars) Goomba instead of the SMW Goomba? 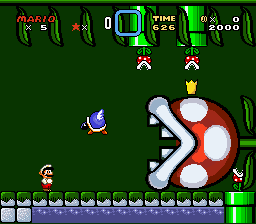 Just a personal preference of look, or is it because the SMW Goombas don't die when stepped on? 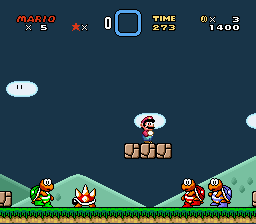 Maybe I'm misinformed, but isn't SMW the only Mario game where the Goombas were like that? Because from my understanding that's the only game that didn't have them as angry walking mushrooms, so it may have something to do with continuity. Well, technically, they're designed as angry, walking chestnuts, not mushrooms, as their original name, Kuribo, implies. Semantics aside, yes, that is the only game where stomping on them doesn't kill them, so I was wondering if he personally didn't like the unconventional SMW version, and maybe that's why he replaced it. 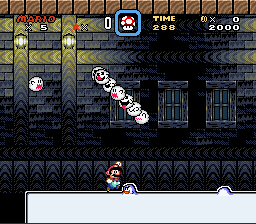 I really always hated the unconventional SMW version of the Goombas, so in my version, they are stompable and look "normal" again. 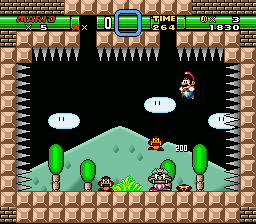 In SMW in Japan, they were called "Kuribon," which may be implying that they were a separate sub-species. Who knows? I'm just aiming for consistency. That was pretty much the only game where they were like that. In Japan, they've always been chestnuts, sure, but in the US at least they have always been mushrooms. 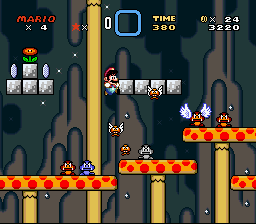 And SMW had some other issues with enemy continuity (see above, I also changed the Amazing Flyin' Hammer Bros. and Sumo Bros. to be more like SMB3-style Hammer Bros.). 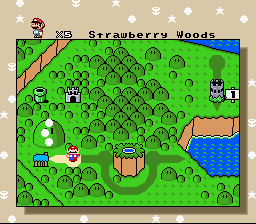 I and a lot of other folks are making games by editing the Super Mario World ROM. A GUI-based program called Lunar Magic makes it as easy as dragging and dropping. 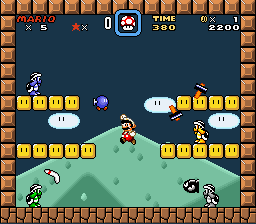 By using other programs, you can insert new enemies, music, etc. - it's pretty fun. And, since you are just editing the ROM, it is compatible with most or all emulators - I can play mine on my PS2. Might want to rig up something to render the port unusable, just to be on the safe side. I was wondering about that too - around Christmas, there were figures for Biggs in his naval uniform and the mantis-armed thing from (I think) SW. Anybody think LFL might be planning to show us the deleted scenes at some point ? 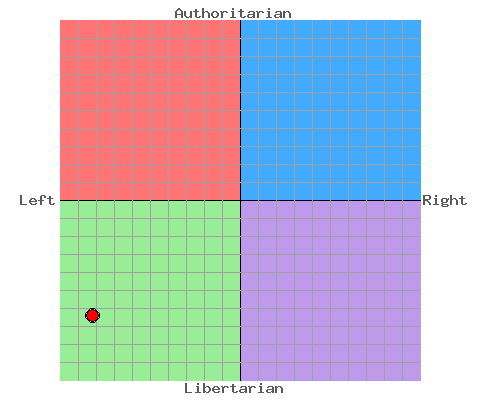 Sums things up pretty well, all things considered. I love the old switcheroo - I do that all the time. I hope I'm not blacklisted at Best Buy/Wal-Mart! FFIX is a PS1 game. You can only save PS1 games (for some dumb reason) on a PS1 memory card. If nothing else, there are great PS1 emulators around now that can play your games from your CD-ROM. Buy a controller for your computer, and the experience is fairly similar. Indiana Jones and The Phantom Menace! I really, REALLY hate that Indy is cracking wise so much in this trailer. So, what was up with Eli/Paul? Any ideas? One of my favorite parts was when Eli went to visit Daniel near the end and is trying to wake him up. He tries several different ways to wake him - all unsuccessful. Finally he screams, "Your house is on fire!" but still, Daniel sleeps on, snoring heavily. Eli leans close and says, "Daniel, it's Eli." The snoring stops. Did anyone else find it interesting that Daniel had zero relationships with women and never was found sleeping in a bed? He was always "camped out," even indoors. Any interpretations of the final line? Also, who else thought that as dark and serious as this was, there were also some hilarious parts? Finally, was I the only one to see some Kubrickian echoes in (at least) the beginning and end of this movie? Has anyone else watched this yet? I would love to see what others thought of this movie. If you've not seen it yet, I would highly recommend it. It is one of the best films I've seen in a long time. Rolling Stone published this really good article on Scientology last year. It's long but definitely worth a read. My favorite strategy guides are my two for Lunar 1 and Lunar 2, which are pretty much my favorite RPGs. Any guide by Working Designs is good. It's chock-full of non-game errata and info. <a href="http://www.exploitstation.com/">Exploit Station</a> is your source for the PS2 Independence Exploit. @C3PX - Yep, I use PGen and SNES Station. Only had minor errors with most games. I have a thick PS2, so I can boot the exploit using an exploited memory card and a PS1 disc. I load games through a flash drive. I haven't tried using the exploit for backups, though you are supposed to be able to use it for that. Even before I loaded the exploit, though, I was able to get some DVD-R burnt movies to play correctly. Few and far between though. Has anyone here used the PS2 Independence Exploit? I use it to play Genesis games and the SNES games that work well.